Live-action Video Series. This series is accessed through our private viewing portal and an internet connection is required for viewing. Once a Family License is purchased, viewing of videos is unlimited so you may use them now with your current child or in the future for upcoming siblings. There is no expiration date for your accessibility with a Family License. Find additional information about this video series on our Video Instruction tab above. Licensing Terms: Two levels of licensing are available: Family License (allows for viewing by one family in a home setting) and Co-op or Classroom License (allows for viewing in a group or classroom setting). A co-op or classroom license grants access by participating families for one year. A family license can be upgraded to a co-op license, however the one-year term of access goes into effect at the time of the upgrade purchase. A Family License is regularly $99.99. Through May 31st, 2019, the Family License is $74.99! Price for Co-op or Classroom License is regularly $199.99. Now, through May 31st, the Classroom License is $159.99. 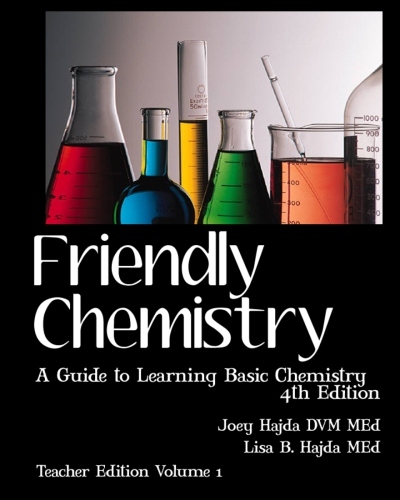 Audio book version of Friendly Chemistry. The 32 lessons fo Friendly Chemistry are read by Dr. Joey Hajda while Powerpoint slides move by on the screen. See samples on our Video/Audio Instruction Tab. Your audiobook comes to you on a USB Flashdrive. Files are MP4 formatted with compatibility across almost all devices which have a USB port and can play MP4 files. Regularly $59.99. On sale through May 31st, 2019 for $35.99!